I went to Caption Comics Convention at the weekend, which is based in the city I live, Oxford. Considering I’ve been here for the past 7 years I should probably have attended it before now, especially since last years theme was ‘Away with the Fairies’ of all things. I love faeries! And I missed it! But in my defense I’ve never seen it advertised anywhere locally. But this year I made it and it’s totally unlike any other comics convention. I mean, at most of them the exhibitors rent their table and sit behind it all day gradually getting a numb-bum. Not so here. Comics are checked-in at the beginning to be sold at a big table by the organisers and then everyone is free to enjoy the show, fans and creators alike. It’s much more of a social, rather than commercial, place. It’s about meeting new people and sharing art. Boy, do I know a lot more people in the UK comics community now! Look there’s me in the middle! I spent quite a lot of time hanging out on the Dino-saw-us table drawing stickers to swap, only to realise I was drawing on the wrong side and having to start all over again. Fail! I watched some very interesting talks by incredibly talented artists among them P.J Holden, Melinda Bebbie, Sydney Padua and Darryl Cunningham, and – here’s the thing – get to hang out with them afterwards. I was lucky enough to have practically an one-on-one art tutorial with Al Davison when his workshop collided with a talk. He looked at my comic and gave me some very useful tips I’ll definately be using. Original artwork was literally going for a song at the art auction. 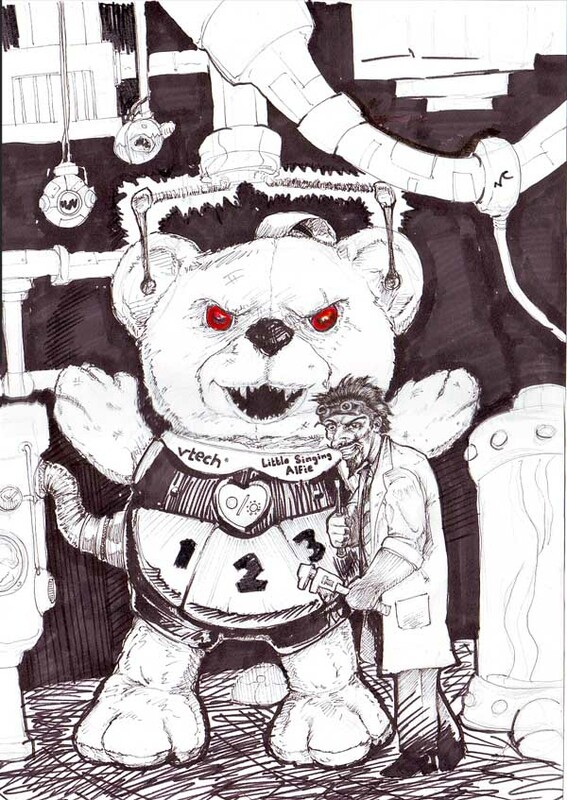 I bought this drawing of an evil teddy by Norm Chung for £3! Mwahahaha!